Suzanne Jones and K Ragland scored 0.66 masterpoints with a 57.2% game at ACBL Unit 359 - Boulder Bridge. See full results of this game. Jeanne Gray and Jim Johnson scored 0.39 masterpoints with a 55.97% game at ACBL Unit 359 - Boulder Bridge. See full results of this game. Jim Johnson and Wayne Leanza scored 0.39 masterpoints with a 54.63% game at ACBL Unit 359 - Boulder Bridge. See full results of this game. Jeanne Gray and Carol Ward scored 0.77 masterpoints with a 57.04% game at ACBL Unit 359 - Boulder Bridge. See full results of this game. Gary Greene and Roger Plowman scored 1.10 masterpoints with a ★62.41%★ game at ACBL Unit 359 - Boulder Bridge. See full results of this game. Gary Logan and Suzanne Jones scored 0.23 masterpoints with a 52.96% game at ACBL Unit 359 - Boulder Bridge. See full results of this game. Jeanne Gray and Carol Ward scored 1.05 masterpoints with a 59.32% game at ACBL Unit 359 - Boulder Bridge. See full results of this game. Michael Perlman and Roger Plowman scored 0.53 masterpoints with a 57.4% game at ACBL Unit 359 - Boulder Bridge. See full results of this game. Roger Plowman and Bette Suzuki scored 1.30 masterpoints with a ★61.57%★ game at ACBL Unit 359 - Boulder Bridge. See full results of this game. Jeanne Gray and Laurie Simons Divine scored 0.91 masterpoints with a ★60.18%★ game at ACBL Unit 359 - Boulder Bridge. See full results of this game. 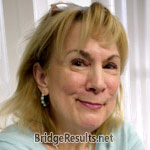 Michael Perlman and Suzanne Jones scored 0.49 masterpoints with a 55.77% game at ACBL Unit 359 - Boulder Bridge. See full results of this game. K Ragland and Gary Logan scored 0.49 masterpoints with a 56.42% game at ACBL Unit 359 - Boulder Bridge. See full results of this game. William Brackett and Paul Flanders scored 1.40 masterpoints with a ★60.76%★ game at ACBL Unit 359 - Boulder Bridge. See full results of this game. Jim Hoerlein and Gary Greene scored 0.23 masterpoints with a 52.24% game at ACBL Unit 359 - Boulder Bridge. See full results of this game. Gary Logan and Suzanne Jones scored 0.46 masterpoints with a 53.1% game at ACBL Unit 359 - Boulder Bridge. See full results of this game. Donna Plowman and Roger Plowman scored 0.26 masterpoints with a 52.73% game at ACBL Unit 359 - Boulder Bridge. See full results of this game. Sharon Baumann and Martha Gagliano scored 0.65 masterpoints with a 53.96% game at ACBL Unit 359 - Boulder Bridge. See full results of this game. Gary Greene and Mindy Smith scored 0.46 masterpoints with a 53.34% game at ACBL Unit 359 - Boulder Bridge. See full results of this game. William Brackett and Paul Flanders scored 1.30 masterpoints with a 57.16% game at ACBL Unit 359 - Boulder Bridge. See full results of this game. William Brackett and Paul Flanders scored 4.52 masterpoints with a ★68.05%★ game at ACBL Unit 359 - Boulder Bridge. See full results of this game. Suzanne Jones and Paul Flanders scored 0.25 masterpoints with a 53.61% game at ACBL Unit 359 - Boulder Bridge. See full results of this game. Andrew Johnson and Roger Plowman scored 1.50 masterpoints with a 59.18% game at ACBL Unit 359 - Boulder Bridge. See full results of this game. Sharon Baumann and Judith Hardie scored 0.30 masterpoints with a 52.12% game at ACBL Unit 359 - Boulder Bridge. See full results of this game. Gary Greene and Zetta Feder scored 1.05 masterpoints with a 57.97% game at ACBL Unit 359 - Boulder Bridge. See full results of this game. Gary Logan and Suzanne Jones scored 0.53 masterpoints with a 54.67% game at ACBL Unit 359 - Boulder Bridge. See full results of this game. Donna Plowman and Jeanne Gray scored 0.90 masterpoints with a 55.49% game at ACBL Unit 359 - Boulder Bridge. See full results of this game. Gary Greene and Carol Ward scored 0.25 masterpoints with a 51.79% game at ACBL Unit 359 - Boulder Bridge. See full results of this game. Sharon Baumann and Elizabeth Coulon scored 0.90 masterpoints with a 55.49% game at ACBL Unit 359 - Boulder Bridge. See full results of this game. Michael Perlman and K Ragland scored 1.40 masterpoints with a ★60.95%★ game at ACBL Unit 359 - Boulder Bridge. See full results of this game. Jeanne Gray and Jean Hupka scored 0.98 masterpoints with a 58.88% game at ACBL Unit 359 - Boulder Bridge. See full results of this game. Denise Desbarats and Nettie Ashbee scored 0.88 masterpoints with a 56.66% game at ACBL Unit 359 - Boulder Bridge. See full results of this game. Gary Greene and Barbara Yoshimura scored 0.70 masterpoints with a 55.92% game at ACBL Unit 359 - Boulder Bridge. See full results of this game. Sharon Baumann and Martha Gagliano scored 0.32 masterpoints with a 53.4% game at ACBL Unit 359 - Boulder Bridge. See full results of this game. Jeanne Gray and Jean Hupka scored 1.50 masterpoints with a 59.9% game at ACBL Unit 359 - Boulder Bridge. See full results of this game. Jean Hupka and Elizabeth Coulon scored 0.80 masterpoints with a 56.7% game at ACBL Unit 359 - Boulder Bridge. See full results of this game. Kathy Ragland and Carol Ward scored 1.06 masterpoints with a 55.42% game at ACBL Unit 359 - Boulder Bridge. See full results of this game. Gary Steiner and Michael Perlman scored 0.46 masterpoints with a 52.8% game at ACBL Unit 359 - Boulder Bridge. See full results of this game. Sharon Baumann and Martha Gagliano scored 1.88 masterpoints with a 58.71% game at ACBL Unit 359 - Boulder Bridge. See full results of this game. Gary Logan and Suzanne Jones scored 0.75 masterpoints with a 55.22% game at ACBL Unit 359 - Boulder Bridge. See full results of this game. Jeanne Gray and Jean Hupka scored 1.50 masterpoints with a ★66.62%★ game at ACBL Unit 359 - Boulder Bridge. See full results of this game. Sharon Baumann and Elizabeth Coulon scored 0.53 masterpoints with a 58.38% game at ACBL Unit 359 - Boulder Bridge. See full results of this game. Spencer Carr and Paul Flanders scored 0.75 masterpoints with a 54.4% game at ACBL Unit 359 - Boulder Bridge. See full results of this game.